Edmond Hoyle, Gent. : When did Hoyle come off copyright? Bibliography and the book history are two disciplines that reinforce each other. Previous essays have discussed this at a trivial level--I have discussed how cancels in the physical book have been the result of a new publisher. Here I begin to consider a much broader question--the history of copyright in England and it's impact on the Hoyle bibliography. As noted in earlier essays, the Statute of Anne (1709) was the first modern copyright statute. The statute gave authors protection of their literary property for a period of fourteen years with an additional fourteen years should the author still be alive. Aside: Like Hoyle, most authors sold the rights to their work to a publisher, so it was the publisher who benefited when the author live another fourteen years. It seems an odd bit of policy that rewards the publisher for buying works of long-lived authors! Hoyle major works were Whist (1742), Backgammon (1743), An Artificial Memory for Whist (1744), Piquet (1744), and Quadrille (1744). 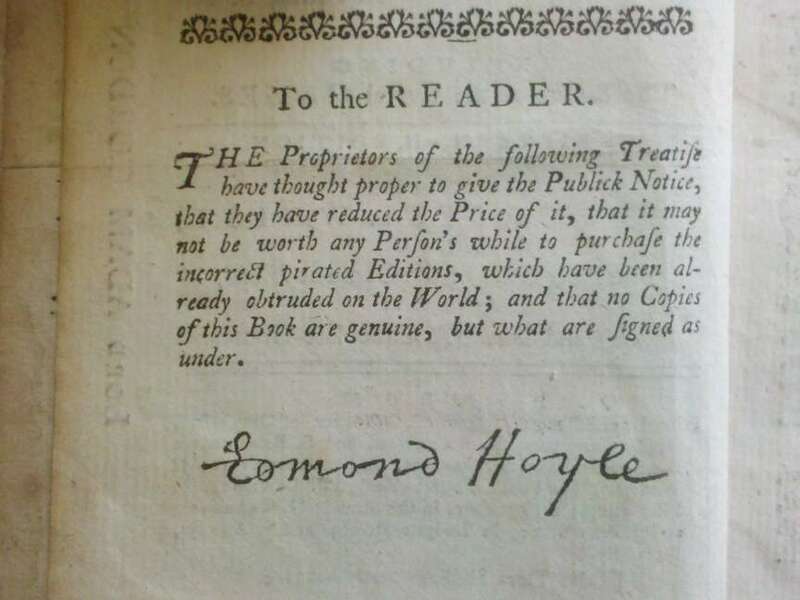 Hoyle lived until 1769 so the copyright period would have been 28 years. 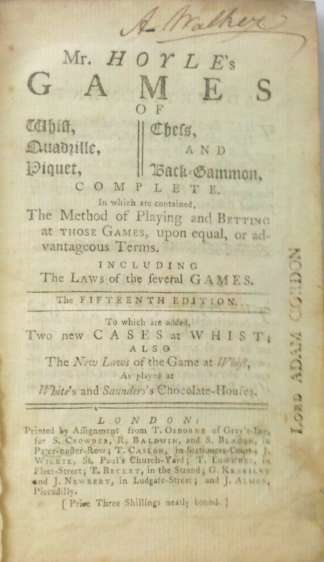 One would expect the treatises to come off copyright between 1770 and 1772. The collections bring up another question. Was it the collection that was protected by copyright or the individual works? Despite the appearance of collections, I would still expect that it was the individual works that were under copyright, with Whist losing protection in 1770 and the others by 1772. In fact, the custom among London booksellers tells another story, both about the Hoyle copyright specifically and the length of copyright protection generally. 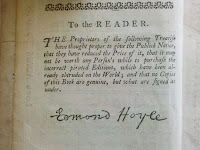 When shares of the Hoyle copyright were bought and sold at the booksellers trade sales (discussed in previous essays), it was the collection and not the individual treatises that were treated as the subject of the copyright. More importantly, the booksellers contended that the Statute of Anne did not change common law with respect to copyright and that common law copyright was perpetual. The booksellers sought to enforce their view in court, and it was not until the 1774 case of Donaldson v. Beckett that the House of Lords held that the Statue of Anne did take away the common law notion of perpetual copyright. Obviously I am greatly abbreviating 65 years of the history of copyright--for more information see the excellent site Primary Sources on Copyright (1450-1900). So by 1774, with Donaldson v. Beckett, copyright was fixed at 28 years. Whether it was the individual or collected works that were protected, the best-selling Hoyle was, for the first time, clearly off copyright. With this bit of history behind us, let us return to bibliography. Would you be surprised to see that 1775 was an interesting year for Hoyles? Stay tuned.